Baghdad, Iraq (CNN) -- Nearly 130 people were killed and more than 400 wounded early Tuesday when a string of five suicide car bombings hit government buildings, a neighborhood and a commercial district in Baghdad, Iraqi authorities said. Iraq's Finance and Labor ministries and a courthouse were the targets of three of the terror attacks, which shattered a two-month period of relative calm in the capital. By evening, Interior Ministry officials put the toll at 127 dead and 448 wounded, the worst since twin car bombings killed and wounded hundreds of people in late October. Iraqi Prime Minister Nuri al-Maliki said the attacks were aimed at undermining Iraq's upcoming elections, now set for March after a lengthy impasse in the country's parliament. "The timing of these cowardly terrorist attacks in Baghdad today, after the success of Iraqi Parliament in overcoming the last obstacle in the election procedures, shows that the enemies of Iraq and its people are aiming to create chaos in the country and prevent any progress in the political process and to disrupt the procedures of the coming elections," he said. 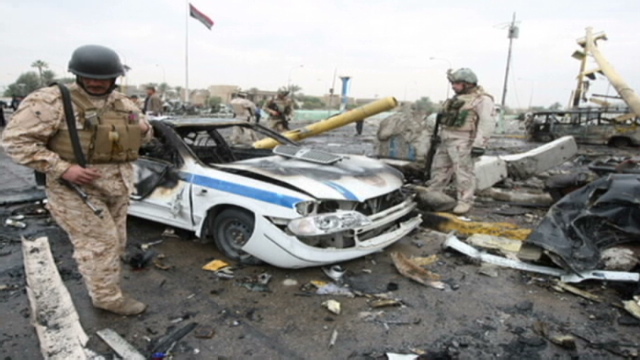 The first of the vehicles blew up in southern Baghdad's Dora district at about 10 a.m. (2 a.m. ET), followed by four more car bombs about half an hour later. Three of the explosions struck at the heart of the Iraqi capital, detonating a few minutes apart. One hit the Ministry of Labor and Social Affairs, while another hit the new site of the Ministry of Finance near al-Qashla Square. The ministry's former building was destroyed in a bombing in August. Another bomb exploded in the busy commercial district of Nahdha, and the fifth bomb blew up outside the Karkh Civil Court in western Baghdad's Mansour district. The sounds of sporadic gunfire and emergency sirens could be heard immediately following the attacks, and smoke from the blasts billowed into the morning sky. Suicide bombers carried out the five attacks, Brig. Gen. Qassim Atta, a spokesman for the Baghdad Operations Command, told CNN. At the United Nations, Secretary-General Ban Ki-moon condemned the attacks and offered his "heartfelt condolences" to the families of those killed, according to a statement from his office. "The Secretary-General appeals to the people of Iraq to remain steadfast in the face of these attacks and to continue their determined efforts to achieve national reconciliation," the statement said. "The United Nations remains committed to supporting them." And the human rights group Amnesty International said there was "absolutely no justification" for the bombings, noting that indiscriminate attacks on civilians are war crimes under international law. Suicide bombers were also blamed for the two bombings October 25 in Baghdad, which killed 160 people and wounded 540. Those bombs detonated in quick succession at mid-morning on a Sunday, the first day of the workweek in Iraq, in the Salhiya district of central Baghdad. The location was close to the Foreign Ministry. Government officials, including Baghdad's governor, questioned how the bombers were able to penetrate the area's security, which was supposed to have been improved in the months leading up to the attacks. Authorities subsequently detained more than 60 people responsible for security in the district where the bombings took place. And Tuesday's attacks sparked debate among Iraqi lawmakers about the capability of the country's security forces. Noor Aldeen al-Haiali, a member of Iraq's parliament from the country's largest Sunni Arab party, said al-Maliki's government "failed in taking the measures to protect the targeted Iraqi citizens, who are shocked and getting slaughtered on a daily basis." Ali al-Adeeb, a senior member of the prime minister's Dawa party, said security has improved in recent years. But Kurdish lawmaker Mahmood Othman told CNN that more attacks could be possible "because the people against the political process, against the elections and against stability in Iraq" will try to disrupt the elections. And he said stepped-up security measures won't be enough to deter them. "There should be some political stability, political reform, reconciliation," he said. "These are also very, very important to provide security."